This article has been peer reviewed and published by Correlation, 24, No. 1, pp. 5-20. Copyright © 2006 by Kenneth McRitchie . Abstract: Astrology texts provide details of astrological practice and interpretation, but astrology theory has not been well described. One approach to theory is to consider astrology as a study of natural symmetries rather than a study of causal interactions. Simplified versions of astrological frames of reference bear a suggestive resemblance to various patterns of personality and behavior that are identified within the social sciences, particularly those that deal with shared values, skills, and beliefs. Astrological operations within these frames of reference similarly suggest identifiable patterns of love, development, and a mechanism of psychological projection. A research program of further study should confirm and account for these similarities through a cross-disciplinary analysis and correlation of empirical findings. What is the theoretical basis of astrology? I first encountered this question several years ago in a private conversation with a University of Toronto philosophy professor. The professor, who taught a course on science and pseudoscience, had asked me for some books on astrology theory. I tried to name a few authors and books, but realized that I could not easily give the professor what he wanted. Although astrology has an extensive literature of implementation and interpretation, astrology theory in modern terms is hard to find. The thing that stuck with me long after this meeting was that the professor did not ask for an astrological mechanism, as others had done, but for astrological theory, and this was new to me. I could appreciate the professor’s request. In any discipline, theory is necessary to describe and test beliefs, eliminate errors, and explore new ideas. If astrology is a discipline, then theory is essential. To many critics who are unfamiliar with the traditions and practice of astrology, the theory of astrology, if it exists at all, seems like a black box filled with confusion. Astronomical factors go into the box and interpretations are pulled out of the box. Without clearly-defined theories of astrology, the transformation of astronomical input to astrological output seems to these critics to have no explanation other than intuition, delusion, or deception. I began to wonder what an astrology theory would be like if it was accessible and well-defined in the modern mind. To satisfy the professor’s request, I began to reverse-engineer astrological ideas and reassemble them as rudimentary theory that could form the basis of a research program. I examined the definition of astrology, its basic principles, its frames of reference, how it could be simplified, and how it could be compared to models and systems in the social sciences. Drawing upon Western psychological astrology in particular, I looked for patterns that could be limited and defined. I was more concerned with consistency than with being inclusive, comprehensive, or historical. Like science theory, astrology theory, if there was to be such a thing as generally understood today, needed to be reduced to simple, falsifiable concepts that could be worked to explore ideas and remove errors. Such tests as these are done with little or no understanding of astrology and its limitations. These tests simply bash the black box of astrology theory from the outside to elicit perceived defects and errors. On the other hand, statistical tests that explore the incidence of a single observed trait or feature in sample populations have shown greater success for astrology, although they are not well known in mainstream science. (2) It seemed to me that if the black box of astrology theory could be made more transparent, then the errors produced by the one-to-one matching tests could be understood and the more successful statistical trait research would have a supportive structure upon which to build. To clarify astrology theory, there first needs to be a more rigorous definition of astrology. The term astrology itself means the study of the celestial bodies, but how accurate is this definition? Do astrologers actually study the Sun, Moon, planets, and stars, or do they study some process? My own exploration of astrology led me to think that astrology is actually the study of cyclic events that are observed within astrological frames of reference. Importantly, planetary properties are not directly observed by any cause and effect mechanism, nor are they divined, but instead are indirectly inferred through the logical examination of their placements within the symmetries of these frames of reference. This inference of environmental symmetry carries an important non-intuitive implication. It should be supposed in astrology that, as part of the design economy of nature, events within a microcosmic environment, such as the life circumstances of an individual, mirror in consistently understandable ways the events within a symmetrically-related macrocosmic environment, such as the celestial environment surrounding the individual. It is these environments, as they are measured and mapped by the astrological frames of reference, which form the basis of the astrological chart. The proper understanding of these environments is therefore essential for our understanding of both the astrological properties of the planets and the inferred character of individuals. To more fully grasp this idea of cosmic symmetry, a more recent concept that is somewhat similar is seen in the infinite regression of self-similar structures within fractal geometries that iterate at different microscopic and macroscopic scales. This “self-similarity” property of fractals is a type of cosmic symmetry between outer and inner worlds. As far as it resembles fractal self-similarity, which is well understood, the idea of cosmic symmetry is conceptually valid as a mapping principle for correlating behaviors, and this concept, as it stands, can potentially provide a way to illuminate the black box of astrology theory. Provided the natal chart of an individual at the microcosmic boundary is accurately aligned within its macrocosmic celestial environment by using accurate birth data, then it should be possible to reliably map behaviors from the boundary of one world to the other by observing cosmic symmetries. The application of these symmetries, and our accumulated observations within them, should provide the factors we need to infer astrological meanings. This concept of cosmic symmetry between macro and micro worlds is consistent with the widely accepted presumption in astrology that no causal mechanism directly acts between the celestial bodies and the individual. This astrological connection has been described as being acausal and synchronistic (Jung, 1973), as well as diachronic (Tarnus, 2006), which means that the connected events occur or change over time. The diachronic synchronicity between the astrological macro and micro world boundaries can be considered to be a natural feature of space and time. To better understand space, time, and the other organizational concepts used in astrology, we need to define some basic principles, which will establish the astrological paradigm. Principles are desirable in any discipline to provide points of understanding and agreement in discussion. Principles can separate astrological concepts from non-astrological concepts and guide the development of astrological theory. Correlativity—“What is below is like what is above, and what is above is like what is below, to accomplish the miracle of the one thing.” Microcosms and their macrocosms are natural, symmetrical, and aligned. Cosmic environments consist of comparative frames of spatial reference that unify the microscopic and macroscopic worlds. Nativity—“All things are born from the one thing by adaptation.” Each individual, whether it is a person, thing, or an event, is a microcosm born at the center of its own macrocosmic universe. Each individual has its own planets, is identified with its native circumstances, and has a sensitive dependence on its initial configuration within the world of experience that is known and shared in common among other individuals. The circumstances of birth show what has begun. Coevolution—“The music of the spheres.” All cosmic boundaries centered on the individual move in concert with the individual. Cosmic environments delimit temporal cycles, which all resemble each other by developmental phases. Microcosms and their macrocosms are diachronically synchronous. Correlation—“The stars incline; they do not compel.” Cosmic environments delimit observable propensities. Populations and individuals develop tendencies related to features within these environments. Species of meanings are identified by the incidence of tendencies that increase with eminence or extreme. Correlevance—“It is written in the stars.” Singular observed tendencies and their symbolically specified meanings grammatically associate in relevant artful patterns as both enchanting and disenchanting languages of interpretation or divination. Microcosms and their macrocosms are functionally coherent. Accepting these principles means that some ideas that have been previously adopted within Western astrology need to be re-examined. For example, the tropical signs of the zodiac, which precess through the starry constellations that have the same names, have no equivalence with these constellations other than their names and any astrological equivalence must be rejected in principle. The constellations, which are simply imaginative designs, are not natural, symmetrical formations and therefore, unlike the tropical signs, do not constitute a consistent and legitimate astrological frame of reference as requied by the astrological paradigm. This rejection of constellational significance, however, is in keeping with normal astrological practice in which the stars are considered individually, and not as constellational aggregates. Furthermore, in accord with these principles, the galactic center, which represents a celestial body like the stars and planets, does describe an applicable long-term cycle as it moves through the zodiacal signs. Western astrology uses three spatial frames of reference, each of which is based on symmetrical features found in nature. These reference frames precisely measure the three main cosmic environments studied in astrology, which unify the microscopic and macroscopic worlds. These are the zodiacal signs, the diurnal house sectors, and the aspects (which are basically the phase angles that the planets make with each other). Each of these cosmic environments, when reduced to its most basic components, consists of a horizontal axis of equality and, perpendicular to this, a vertical axis of hierarchy, see Figure 1. Figure 1. Symmetry defined by equality and hierarchy. In the signs, these axes are the equinoxes (equality axis) and solstices (hierarchy axis) respectively. In the houses, they are defined by the horizon (equality axis) and meridian (hierarchy axis) respectively. In the aspects, they are defined by the new/full (equality axis) and the first-quarter/last-quarter (hierarchy axis) planetary phases respectively. For the purpose of theory development, we shall use a simplified four-stage cycle that is based on the equality and hierarchy axes only, rather than the complete twelve-stage cycles that are traditionally used for the astrological signs and houses, or the multiple stages used for aspects. This four-stage cycle is helpful because it identifies basic features in the astrological environments that are similar to several patterns or systems that are described by the social sciences. Once these simple patterns are identified, the more traditional astrological themes, such as the elemental fire, earth, air, and water divisions, can be added to provide a more complete description such as one would find in a typical astrological textbook. Astrological theory can be better understood and appreciated if it can be directly compared with conceptually similar theories of personality and behavior within the social sciences. This comparison would be all the more meaningful if we can find good fits that have no direct or implied connection to astrology. 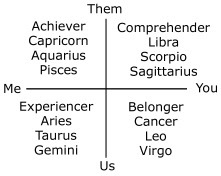 Six of the seven personality and social theories that are described in the following sections were developed independently of astrology, but lend themselves to comparisons with simplified astrology. Three of the astrological theories describe personality in terms of shared values, skills, and beliefs, as they relate to our simplified environments of the signs, houses, and aspects respectively. These are compared to similar concepts in the social sciences. The astrological properties of the planets themselves do not resemble anything in the social sciences and are represented here by a separate astrological theory of urges. And finally, the dynamic operations within the three astrological environments are compared to behavioral theories of love, development, and psychological projection, as identified within the social sciences. Moreover, the astrological theory of projection illustrates how all of these theoretical functions of astrology work together. The four-cycle frame of reference that describes our simplified version of the astrological signs bears a resemblance to various established four-fold systems of values. In the context of this discussion, values are the individual and oftentimes shared sense of what is interesting, important, ethical, purposeful, and meaningful. Values are taken here to be inner attributes of the personality. Included within the broad understanding of values are the qualities known from ancient times as virtues, such as courage, prudence, honor, and ambition. In more recent times, values have appeared as the four stages of civil society and moral order that were described by the influential Scottish Enlightenment philosopher Henry Home (aka Lord Kames, 1758). In the mid-twentieth century, many thinkers wrote about values. Examples are the four social behaviors described by sociologist David Riesman (1950), the four-step hierarchy of needs described by psychologist Abraham Maslow (1954), and an essentially four-fold pattern within the psychographic profiles described by social psychologist Arnold Mitchel (1983). I have chosen these last three social scientists from among many authors with similar ideas because they represent a thread of development that culminates with Mitchel's large-scale empirical research, which could be of potential interest to astrology. Each of these social scientists perceived values as a hierarchical series of steps that ascend in the same order. In astrology, however, there is no simple up and down hierarchy. Instead, astrology postulates values as a developmental cycle that repeats and evolves. Table 1 lists a simple key-word comparison showing the relationship of the four-fold value types. The key words associated with the astrological sign quadrants are shown in Figure 2. Figure 2. Values defined by the grammar of identity. The structure of this figure reflects a more general grammar of identity that is formed by the two major axes. 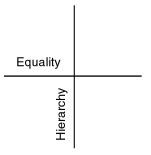 The axis of equality (the peer axis) represents one-to-one relationships of equality, where the value of me opposes the value of singular you. The axis of hierarchy (the parental axis) represents collective relationships, which is the common ground of agreement between “me” and “you”. On this axis, the value of us opposes the value of them. A me-directed person values his or her own experiences, feelings, and needs above all else. An us-directed person values his or her membership within a family or community group above all else. A you-directed person values association with a partner or close friend above all else. A them-directed person values reputation and position as a representative of a public organization above all else. Four-fold systems of values are fairly pervasive in today’s society and can even be found in the popular Harry Potter novels by J.K. Rowling. For example, in the novels the Hogwarts School of Witchcraft and Wizardry consists of four schools that are suggestive of these values: Gryffindor (courage), Hufflepuff (prudence), Ravenclaw (honor), and Slytherin (ambition). There are even numerous online “sorting hat” quizzes derived from the novels that in theory would approximate the sign quadrants. More psychologically refined values tests, similar to the approach demonstrated by Mitchel, should correlate to the distribution and preponderance of planets within the sign quadrants of sample astrological charts. The astrological reference frame of houses appears to associate with skills and aptitudes. Skills can be thought of as the outward adaptations of the personality to the everyday environment. These are one's calling in life and what one is good at doing. By applying our simple grammar of identity to skills, we can posit two fundamental skills that one can express in relation to those people who are one's equals. One can either compete or cooperate. Similarly, we can posit two fundamental skills in relationships of hierarchy. One can either lead or follow. Skill in all four of these areas is necessary for survival, but exactly how they are proportionally expressed is unique to the character of the individual. By synthesis of these four skill polarities, four main skill roles can be defined. These roles can be given suitable names such as: Defender (compete + follow), Provider (follow + cooperate), Promoter (cooperate + lead), and Challenger (lead + compete). Figure 3 shows how these roles fit into the house coordinates. 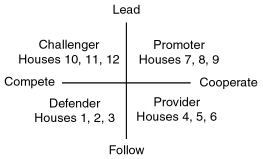 In theory, the distribution and preponderance of planets within the house quadrants of sample astrological charts should correlate to the strength of skills in each of these four areas. Figure 3. Role identities defined by adaptive skills. These meanings that are derived from the astrological environment of the houses compare suggestively to some of the multiple intelligence personalities described by psychologist Howard Gardner (1983). In particular, Gardner’s interpersonal intelligence suggests cooperative skills, and Gardner's intrapersonal intelligence suggests the more self-oriented competitive skills. This example suggests a basis for further research involving sample populations. The astrological reference frame of aspects, which are simply the degree alignments of the waxing and waning phases that the planets each make with one another, associates in astrology to the individual's belief system. The four major aspects of interest in this simplified version of astrology are the conjunction, waxing square, opposition, and waning square. In the more familiar terms of the Sun-Moon phases, these four aspects are represented by the new, first quarter, full, and last quarter phases respectively. These four aspects, which operate between all of the planets, are traditionally thought to be associated with potential conflicts, and this suggests a connection to beliefs because conflicts often stem from strongly held beliefs. In the psychologically broader sense, beliefs can also be associated to patterns of attitudes, temperaments, outlooks, assertions, opinions, goals, biases, habits, and unconscious perceptions. When viewed as such, beliefs can be appreciated as the emotional component of the personality that is expected to mature with development over time. A person with a clear purpose in life might expect to learn with experience how to respond appropriately and competently in situations that involve conflict and emotional tensions. Referring to the literature of the social sciences, the meanings of the four major astrological aspects compare favorably to the four-fold system of emotional intelligence that was originally described by psychologists Peter Salovey and John Mayer (2004). This concept of emotional intelligence has been subsequently popularized by Daniel Goleman (2006). The basic types of emotional intelligence as they compare to an interpretation of astrological aspects are listed in Table 2. Figure 4 postulates this interpretation relative to the associated astrological axes and quadrants. Statistical research that uses the methods of Salovey and Mayer or Daniel Goleman can provide data for correlation and should account for the strength and preponderance of aspect types in sample astrological charts. Figure 4. 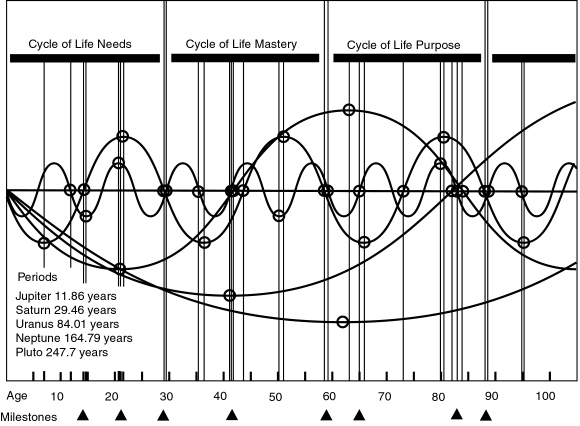 Beliefs defined by the cycle of maturity phases. The conjunction aspect relates to self-confidence issues in relation to one’s own experiences. The waxing square aspect relates to self-reliance issues in relation to one’s family and tradition. The opposition aspect releates to self-restraint issues in relation to one’s parther or close assoicates. The waning square aspect relates to self-discipline issues in relation to one’s reputation and position. The importance of how the houses align within the signs in the natal configuration of any individual can be appreciated by the potential for conflict between values (what one feels is important and interesting) and differing skills (what one can do well). In the unfolding of this theory, one of the major ways that this potential conflict is resolved is through the expression of love. Modern astrology has placed great emphasis on interpersonal love relationships. As discussed earlier, the horizon axis (a component of the astrological houses) represents adaptive relationships of equality, because the horizon is where all things are on the same physical level. Thus the planets or signs that are on the horizon in any natal configuration should indicate relationships with people who are equals to the native, including love relationships with equal partners. Because the horizon axis intercepts two zodiacal signs, one in the east and one in the west, this would mean that there are six pairs of opposing horizon signs that can be associated with the values that the individual seeks to express in a love relationship with an equal partner. Although the signs in these six polarities oppose each other, each pair has common attributes that define and balance their opposition to one another. With knowledge of the astrological signs, the six polarities of horizon signs can be found to compare with the six categories of love styles that were originally researched and described by sociologist John Alan Lee (1975), as postulated in Table 3. Further research that correlates the questionnaire-based findings of Lee with a survey of horizon signs in sample astrological charts should account for these similarities. Table 3. Comparison of horizon signs with categories of love styles. The planets are the material bodies that are measured within the astrological frames of reference. The astrological maxim, “The planets impel,” suggests that the planets represent inner urges, intents, desires, and dispositions that motivate the personality or drive actions. As yet, there exists no defined system or set of urges within the social sciences that would directly compare with the astrological meanings of the planets considered strictly as urges. However, the statistical findings of Michel Gauquelin (1988) seem to indirectly support this interpretation of planetary urges through empirical observation. At risk of oversimplification, the astrological meanings of the planets, when reduced to the extreme, appear to resemble a kit of simple but powerful tools that the individual uses to shape his or her world and develop as a person. These tools can be used, for example, to alternatively fill or empty, to bond or split apart, to expand or reduce, to evade or capture, and to mobilize or set. A much simplified list of the theoretical meanings of the planetary urges is postulated in Table 4. Each of the three astrological frames of reference have four main axial turning points and astrologers expect some sort of notable occurrence in the life of an individual when each transition point is crossed by a transiting planet, particularly within the houses or aspects. When viewed developmentally, each of these four crucial points should define the transition from one a distinct life phase to another within the pattern of a complete cycle. In astrology, the most significant developmental patterns are those made by the slower-moving outer planets, Jupiter, Saturn, Uranus, and Neptune, as they align with and transit the four major aspects to their original positions at the time of birth. Thus, a transiting planet may conjoin, wax a square, oppose, or wane a square to its own natal position. If the planets represent urges and have a sensitive dependency on their initial configuration, then each of these particular types of transits should result in self-conflicting or self-contradictory beliefs in identity that are driven by a single urge. Because the timing of these identity transits is a function of planetary speed, they occur at approximately the same ages for everyone. The exception to the regular timing of the outer planets is Pluto, whose orbit is so elongated that aspects to its original position can occur at noticeably different ages for different years of birth. The cycles of the other outer planets can be fairly reliably charted as a norm to indicate the transits when a significant identity crisis is expected to develop in anyone's life, as posited by the small circles on the phase diagrams in Figure 5. Figure 5. The base planetary rhythms coincide at ages commonly associated with significant life transitions. Because the cycles of the planets are harmonically related as a system, and their phases tend to coincide at certain times, there are approximate ages in everyone's life when multiple identity crises tend to emerge. These periods, which astrologers consider to be particularly problematic, tend to be around the ages of 14, 21, 29, 42, 59, 65, 83, and 88. The overall developmental pattern that emerges from this set of normal phase alignments is well-defined and well-known within astrology, and appears to compare favorably in both timing and perceived effects to various models of coming-of-age transitions that are also known in adult developmental psychology. Some of the authors of these life transition studies in adults are Erik Erikson (1959), Gail Sheehy (1974), Daniel Levinson (1978), and Roger Gould (1978). In Figure 5, the triangular milestones on the x-axis indicate the approximate ages when these multiple transitions can be expected to occur. These multiple transits astrologically mark the most significant transitions in an individual's life. Further research that uses accurate birth data should correlate these major astrological transitions with the timing of major life transitions as reported by test subjects. In astrology, planetary transits indicate not only potential conflicts, but latent energies that need to be applied to the development of life purposes and goals. The process by which values, beliefs and skills are developed can be described by a proposed psychological mechanism of projection that operates during periods of transition and conflict. This mechanism resembles models of interpersonal and transpersonal interaction that go back to Freud, but in astrology the mechanism is more extensively applied to encompass even the minor conflicts and transitions of everyday experience as we continually seek to define ourselves and our environment within the continually changing world. In this extended astrological sense, projection is what occurs when specific urges interact during corresponding periods of planetary transits. The individual projects a subjective urge, characterized by a transited natal planet, onto external “hosts,” which can be other people, things, places, or conditions that most accurately embody and reflect that urge for the individual. These hosts may be perceived by the individual as being helpful, harmful, or a blend of both helpful and harmful potentials. The purpose of astrological consultation is to enable the individual to objectively distinguish between potentially helpful and harmful manifestations and to attract helpful manifestations by clearly focused intent expressed through purposeful goals and attitudes. Table 5 posits some very basic examples, which are only a few among many, of planetary hosts. The pattern of this projection model can be associated with three astrological stages that are timed by the incoming, retrograde, and outgoing appearance of the transiting planets. The outer planets are incoming (approaching the earth in distance) during their morning stage (rising and setting before the Sun) and outgoing (receding from the earth) during their evening stage (rising and setting after the Sun). The planets Mercury and Venus, which are closer to the Sun than the Earth, are incoming during their evening stage and outgoing during their morning stage due to the relative motion of the Earth. The retrograde stage of any planet is where the planet appears to move backward through the zodiac due to the relative motion of the Earth while it is in closest proximity to the planet. The Sun and Moon are always direct in motion and do not go through these three stages. The developmental experience that corresponds to these three stages of motion would be for the individual to identify subjective values in the hosts during the incoming stage, to test and integrate beliefs through remedial interactions with the hosts during the retrograde stage, and finally to apply learned competencies and integrity skills during the outgoing stage. If this developmental process is successfully completed, then the individual should be able to report the detachment from troubling thoughts and habits that were emotionally anchored in past circumstances and the establishment of affirmative thoughts and habits that are emotionally anchored to unique purposes and goals that the individual truly values and desires. Also, it should be noted how well the significant hosts encountered during planetary transits correlate in projected character with the postulated astrological properties of the transited planets, as well as how well both the individual and the hosts identify with the postulated objective character of the transiting planets. A further insight that can be gained from the concept of planetary projection is an understanding of how planets can be said to influence people and events. Astrological influence implies that the perceived effects of the planets are somehow indirect, but the operation of this presumed indirectness has never been very clear because of its confusion with physical influences. The concept of planetary projection allows for a psychological mechanism of perceived influences that can be postulated as follows. First, a subjective urge is stimulated within the individual in diachronic symmetry with the alignment (for example by conjunction, opposition, or square aspect) of a transiting planet to a natal planet. This urge is projected by the individual onto applicable external hosts, as defined by the astrological properties of the aligned natal planet. The individual and the hosts influence each other. Thus the "planetary influence" is from the various external hosts, which are indirectly identified with the planetary urges that are projected by the individual. This discussion postulates some basic concepts for illuminating the black box of astrology and testing its theory. It places a stake in the ground to show directions that might align astrology with more mainstream understandings of personality and behavior. Current astrological explorations and findings need to be unified into a disciplined program of research that examines the perceived similarities between astrology and the social sciences as it pertains to such areas as values, skills, beliefs, love, urges, personal development, and projection. The consistent formation of falsifiable astrological theories and hypotheses, combined with cross-disciplinary analysis of empirical data from sufficiently large samples, can lead to potential benefits to knowledge that could help people to live healthier and more meaningful lives. The one-to-one matching tests that are often cited by members of the scientific community do not explore astrological meanings and do not lead to improvements or broader understanding of astrology. Such tests need to be strongly augmented by astrological research that is critically guided by theory. With the development of coherent theory, threads of similar ideas from other disciplines can have the possibility to merge and the research effort can potentially be sustained by a larger community. Making the black box of astrology theory more transparent and aligned to the concepts of the social sciences is one significant way to reveal potential connections between astrology and other disciplines. The concepts presented in this discussion can have at least one implication that is counter-intuitive to conventional wisdom. In the social sciences, the personality types are typically characterized as quantifiable types of “intelligence” (such as multiple intelligences or emotional intelligence), which the individual is presumed to possess. The astrological reference frames that are theoretically associated with these intelligence types are measured by symmetries within the individual's natural environment. It follows that if these environmental symmetries are part of the observed organization of personality, and intelligence is a feature to be studied in the external natural environment, then the individual does not exclusively possess intelligence as an internal quality. The implication then would be that the individual is native to intelligence as much as intelligence is native to the individual. This would present a further challenge to the anthropocentric view of the universe and the nature of intelligence. Typical double-blind matching tests challenge astrologers to match natal charts one-to-one with data drawn from personality tests or other self-reported questionnaire results (Carlson, 1985; Nanninga, 1996). Another type of matching test attempts to determine whether the personalities of two persons with similar charts ("time twins") are matched one-to-one according to a predetermined set of criteria (Dean and Kelly, 2003). Incidence tests look for a statistical correlation of chart factors to a single characteristic in sample populations such as the professions (Gauquelin, 1955, 1988), physical attributes (Hill, 1996), addiction (Urban-Lurain, 1981), accidents (Ridgley, 1993), social trends such as economics (Yunan et al, 2001), and large geophysical patterns (Johnston, 2001). Particularly noteworthy are those studies that use escalations of eminence or severity as criteria to eliminate sampling bias and quantify relationships between variables (Ertel, 1988, 1996). Carlson, S. (1985). A double-blind test of astrology. Nature 318, 419-425. Dean, G. and Kelly, I.W. (2003). Is Astrology Relevant to Consciousness and Psi? Journal of Consciousness Studies 10(6-7), 175-198. Erikson, E.H. (1959). Identity and the Life Cycle. International Universities Press, ISBN 0393311325. Ertel, S. (1988). Raising the Hurdle for the Athletes’ Mars Effect: Association Co-varies with Eminence, Journal of Scientific Exploration 2(4). Ertel, S. and Irving, K. (1996). The Tenacious Mars Effect. Urania Trust, ISBN 1871989159. Gardner, H. (1983). Frames of Mind: The Theory of Multiple Intelligences. Basic Books, ISBN 0465025102. Gauquelin, M. (1955). L’Influence des Astres: Etude Critique et Experimentale. Le Dauphin. Gauquelin, M. (1988). Written in the Stars. The Aquarian Press, ISBN 0850306159. Gleick, J. (1987). Chaos: Making a New Science. Penguin Books, ISBN 0140092501. Gould, R. (1978). Transformations: Growth and Change in Adult Life. Touchstone, ISBN 0671250663. Hauk, D.W. (1999). The Emerald Tablet: Alchemy of Personal Transformation. Penguin Books, ISBN 0140195718. Hill, J. (1996). Redheads and Mars: A Scientific Testimony. The Mountain Astrologer, May, pp 29-40. Johnston, B.T. (2001). Planetary Aspects and Terrestrial Earthquakes. freenrg.info. Viewed 2005. Jung, C.G. Trans. R.F.C. Hull. (1973). Synchronicity: An Acausal Connecting Principle. Princeton University Press. Lasswell, M. and Lobsenz, N.M. (1980). Styles of Loving: Why You Love the Way You Do. Ballantine Books, ISBN 0345292286. Lee, J.A. The Colours of Love: An Exploration of the Ways of Loving. (1975). New Press, ISBN 0887701876. Levinson, D.J. (1978). The Seasons of a Man’s Life. Knopf, ISBN 0345339010. Maslow, A.H. (1954). Hierarchy of Human Needs. Motivation and Personality. Harper & Row. McRitchie, K.D. (2004). Environmental Cosmology: Principles and Theory of Natal Astrology, Cognizance Books, ISBN 0973624205. Mitchell, A. (1983). The Nine American Lifestyles: Who We Are and Where We Are Going. Warner Books, ISBN 0446380679. Nanninga, R. (1996/97). The Astrotest. Correlation, 15(2), 14-20. O’Neil, M. (1991). The Switching Control Applied to Hill and Thompson’s Redhead Data. Correlation, 11(1), 24. Ridgley, S.K. (1993). Astrologically Predictable Patterns in Work-Related Injuries. Kosmos, 22(3), 21-30. Riesman, D. with Glazer, N. and Denney, R. (1950). The Lonely Crowd: A Study of the Changing American Character. Yale Univeristy Press, ISBN 0300001932. Salovey, P., Brackett, M., and Mayer, J. (eds.) (2004). Emotional Intelligence: Key Readings on the Mayer and Salovey Model. Dude Publishing, ISBN 1887943722. Sheehy, G. (1974). Passages: Predictable Crises in Adult Life. E.P. Dutton, ISBN 034547922. Tarnas, R. (2006). Cosmos and Psyche: Intimations of a New World View. Viking, ISBN 0670032921. Urban-Lurain, M. (1981). Astrology As Science: A Statistical Approach. American Federation of Astrologers. Tempe, ISBN 086690042. Yuan, K., Zheng, L., Zhu, Q. (2006). Are Investors Moon struck? - Lunar Phases and Stock Returns. Journal of Empirical Finance. 13(1), 1-23.